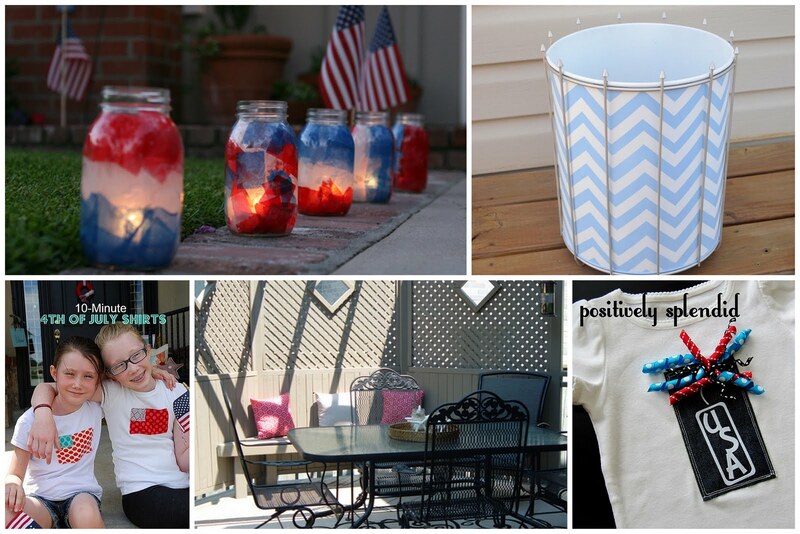 ~Desperately want to try these 4th of July Luminaries that Andrea whipped up. ~Loving Amy's Korker Ribbon Firecracker Tee. ~The rug in Yvonne's Outdoor Room really anchors the space. ~Beckie gave a yard sale trash can a Chevron Makeover. ~Jen made some 10 Minute 4th of July T-Shirts. I bet you could find 10 minutes to make one before Monday! Relics from My Childhood made a desperate comeback. 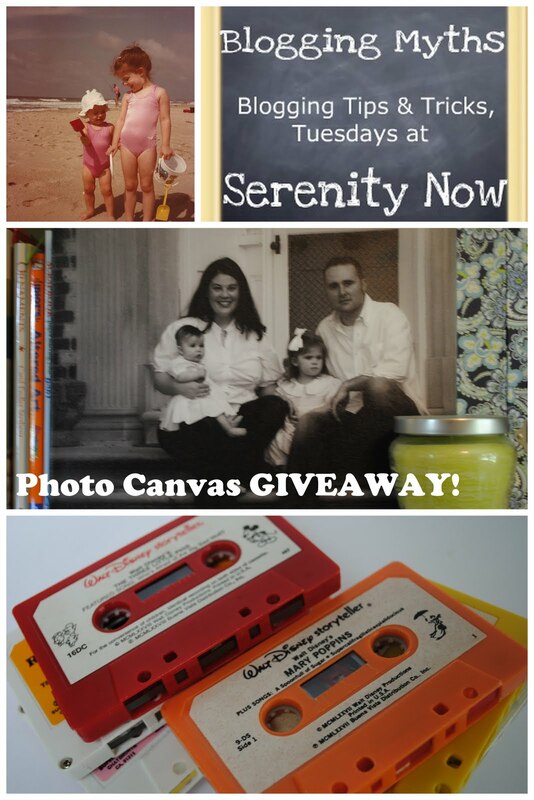 A GIVEAWAY for a Photo Canvas from Easy Canvas Prints! Stop by the post for the details. Link up to this party and include a link back to me or my party button within your post for an extra automatic entry! Today is the last day of VBS, and I will be glad to sleep in for a few mornings. A birthday party the girls are invited to, maybe a bit of beach trip shopping. Nothing major planned for the 4th yet...T always works, so I'm hoping I can convince him to let us have an impromptu cookout when he gets home. Enjoy your weekend ... and happy 4th! Thanks for hosting the link party! I always enjoy snooping around on other people's projects!! i love that trashcan! thanks for hosting, and have a fabulous 4th! What a happy surprise to see that you featured my 'outdoor room', Amanda! Thank you so much- it makes me happy to know you liked it! I've joined your link party and am looking forward to visiting some new blogs this long weekend. I hope you and your family have a wonderful July 4th. I haven't seen a cassette tape in ages. Reminds me of Janet Jackson, The Bangles and Madonna. Too fun! Thanks for setting up the link party! I appreciate all your hard work to put it together. Thanks Amanda! Hope you're having a great week! I read your childhood relics post...very cute. Wish I had saved some of those from my childhood. I did save all my daughters barbies and all their clothes. I had saved all my sons Ninja Turtle and Power Rangers and then one day when he needed new trucks for his skateboard unbeknownst to me he sold them!!! Kids! Happy 4th, hope you get your little bbq! Amanda, I have so much fun with this every week. I just wanted to say thanks for hosting. I love your blog, and not just on Fridays! Thanks for hostessing! Looking forward to seeing what everyone's been up to this week! Happy 4th of July! As always, look forward to browsing the links. Linking back to you :) Thanks for the visit Amanda! Thank you for hosting...enjoy your holiday weekend! Hope you are sleeping in this morning (Saturday) after a long bible school week. I always enjoy your weekly parties and find a few ideas that inspire. Thanks for hosting this party each weekend. I enjoy the variety of blogs that link in and all the wonderful ideas and stories. Your little ones are adorable. Those ten minute tees may make a good project for this weekend. Thanks for sharing! I shared a recipe for a Strawberry Rhubarb Crisp this week. My kids usually insist on chocolate desserts but they really liked this one! Thank you for hosting yet, another great linky party! Thank you for hosting this blog party. I am really enjoying visiting the links from all these creative people! Happy 4th! I haven't been able to link up in a while & I"m excited to do some fun bloggy reading! Thanks for hosting!